2 How Does Espalier Work? 2.1 What’s The Difference Between Formal and Informal? 3 What Are The Best Fruit Trees To Espalier? This old technique has been used on grape vines, fruit and flowering trees, and even large shrubs. Pronounced “ess-PAUL-yay”, the term originates with the French word “aspau”, meaning “a prop”, referencing the trellis that supports branches. It may also have been partially derived from the Italian term “spalliera”, which means “something to lean the shoulder against”. It’s hard to place the exact time and place where the artform of espalier first developed. Ornamental gardening was common throughout the middle ages, including topiary art. However, espalier fruit trees and other forms became widespread at some point during the Renaissance. When we look at tapestries from the period, there are some examples of early espalier shown in them. They’re not universally spread through tapestries or paintings from that time, but they’re visually becoming part of the formal garden culture. 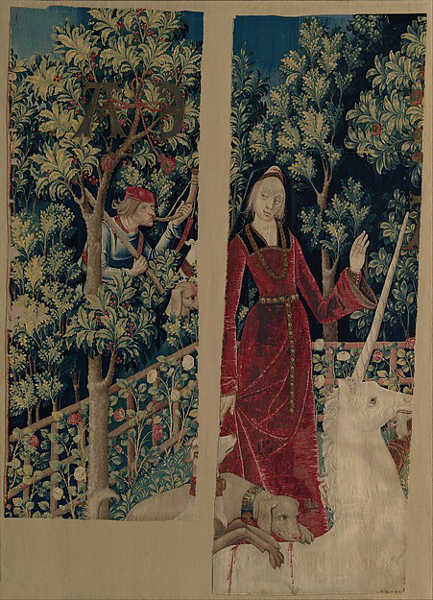 One of the best known examples is in the tapestry fragments of “The Mystic Capture of the Unicorn”, where espalier fruit trees are shown around the enclosed garden. The tapestry, part of the well known Unicorn Tapestries, is estimated to have been made between 1400-1600. Originally, espalier was a reference to trees that were grown against walls. The heat of the walls would provide warmth, which helped fruit to ripen more quickly and protected the trees during the winter months. A contre-espalier or espalier-aere was the original name for a tree grown away from a wall, but using a trellis to shape and form it. The term cordon was another form, wherein the trees were grown as a single stem upwards and at an angle from their straight trunk. At this point in time, almost all of these are considered forms of espalier artistry. Whether you’re creating an intricate archway of orange branches, an elegant privacy screen out of Japanese maple shoots, or simply growing peaches or plums along the fenceline, it is a related process. Espalier fruit trees are planted when they are young saplings, usually about a year to two years old. As the tree grows and matures, supple new-growth branches will be bent to shape and secured to a trellis or wires. This keeps them growing in the desired configuration. New shoots that won’t conform to the desired pattern are pruned off. There are many different shapes and styles of espalier. 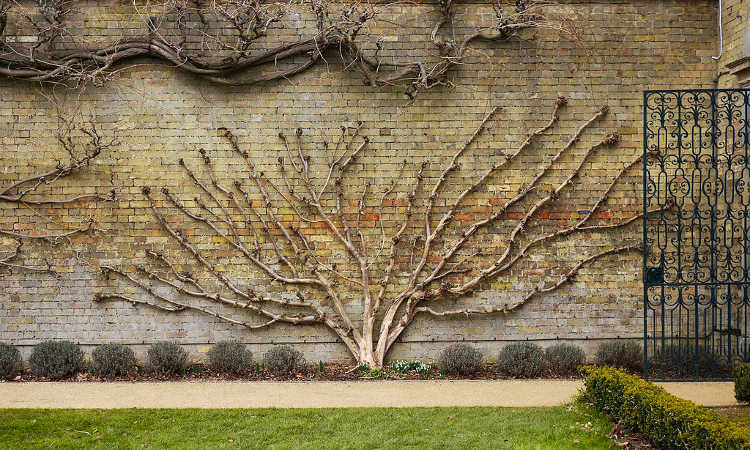 For espaliered trees grown against walls, some of the most common configurations are horizontal branches, a candelabra configuration, or a fan shape. These are especially common for espaliered fruit trees. Cordon-style or contre-espalier patterns include the Belgian fence or lattice, spiraling patterns to go around pillars, various different arched configurations, or horizontal fences. Vineyards often use a horizontal cordon to train the grapes to, creating many short walls of vines. These must be regularly pruned to ensure new branch growth does not harden off without being trained or trimmed. Maintenance also ensures healthy placement of fruit or flowers where they are well-supported by both the branch and the supports. Finally, there is the natural form, where you are essentially training the tree to grow flat against its surface but not training the branches to particular shapes. This is the easiest style for beginners. What’s The Difference Between Formal and Informal? In essence, formal espalier is the more difficult option, where informal is simpler. But let’s go into the differences between the two. 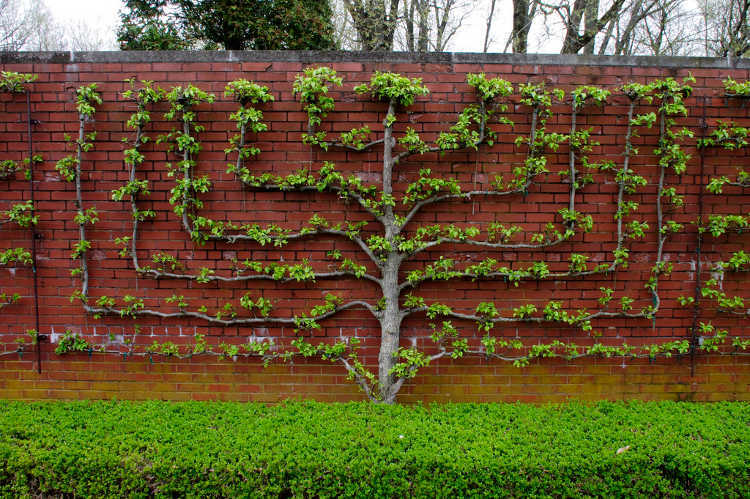 Formal espalier requires consistent and regular pruning to ensure the trees comply with their intended patterning. Formal styles are some of the more ornate designs, like Belgian fences/lattice, spirals, or extremely symmetrical designs. 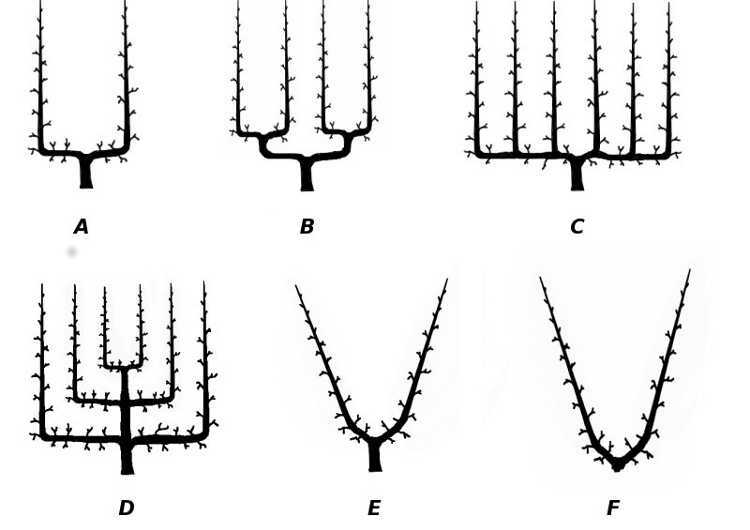 As an example, a very symmetrical candelabra pattern with four branches trained to a fork-like shape would be formal. Similarly, a formal fan would be very symmetrical and very precise. Informal espalier are imperfect patterns. These recognize that trees are not always uniform, and thus do not as forcefully demand exact shaping. One of the simplest examples is the basic Y pattern, where two branches will be trained upward in a V-shape from one trunk. Informal espalier may also allow short, 12″-18″ branches to emerge from the front of the tree, providing extra fruiting space. The trained branches may be less symmetrical, and allow multiple fruiting tips to emerge from them or be on different heights and angles. 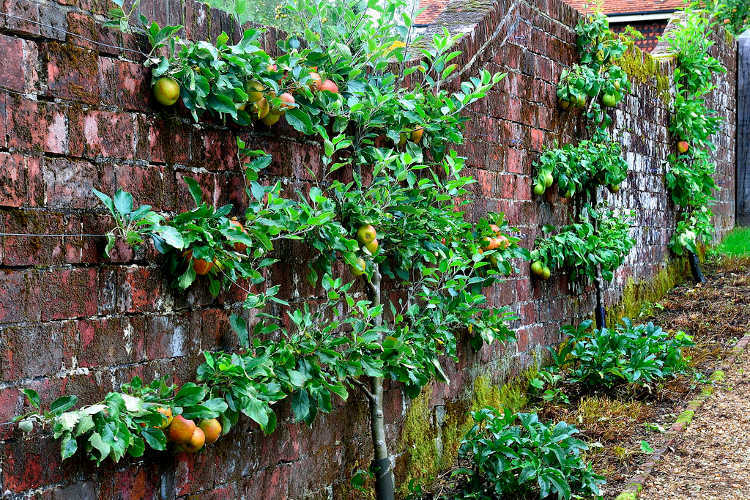 What Are The Best Fruit Trees To Espalier? One of the most common choices, espalier apple tree varieties are extremely common. As apple trees tend to be relatively easy to train, they’re used for a number of different patterns. Horizontal espalier is the easiest, but fan palmetto, candelabra, or spiral cordon are also popular. Pears are much like apples, because both pear and apple trees fruit on spurs rather than on branch tips. 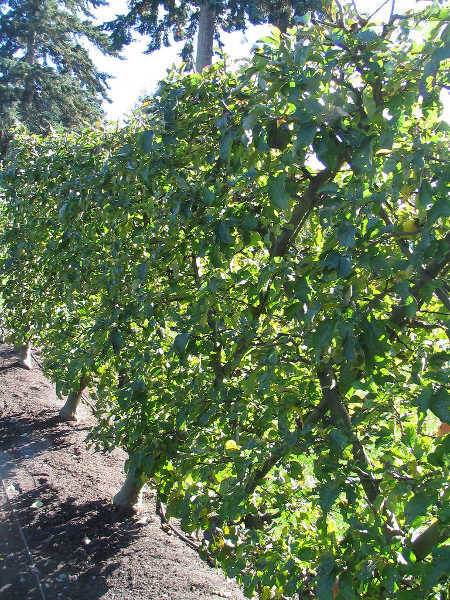 Espalier pear trees often are treated very similarly to apples, but usually are trained horizontal or in a fan shape. Espaliered fig trees are also popular for the horizontal method, although as figs can become large, they are more commonly trained to an informal fan pattern. Various stone fruit trees lend themselves to espalier techniques. 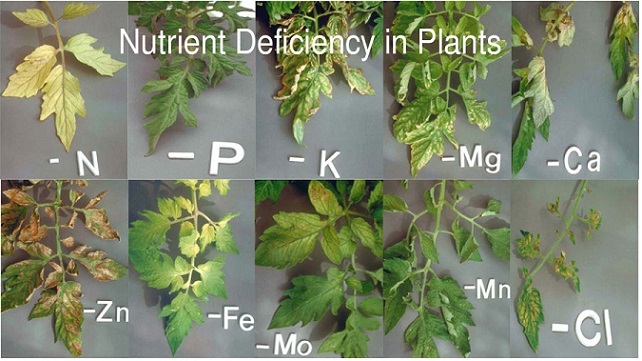 However, different varieties require different care. Plums and apricots both seem to do best as fan shapes but can be trained into a low horizontal hedge as well. Both of these need more attention than some other varieties as they tend to send off lots of young shoots. Peaches and nectarines only produce fruit on new wood, which means that they are going to require a lot more pruning to encourage flushes of new growth. These should be pruned in an informal fan shape to provide room for the young fruiting branches to grow. It is possible to espalier cherries, but it’s only recommended for people who’ve had some level of formal training in the art. Unfortunately, while espalier cherry trees make gorgeous fan shapes, getting them to provide fruit is much more complicated. Espalier pomegranate trees do quite well in natural form, as do some forms of persimmon. Citrus fruits like orange, lemon, kumquat or pomelo can be done, but espalier citrus trees tend to prefer more informal designs over formal patterns. They do well as a horizontal, but fan shapes are much easier to train for these fruits. Ornate designs sound wonderful, but tend to require some training from people who are more experienced at espalier. 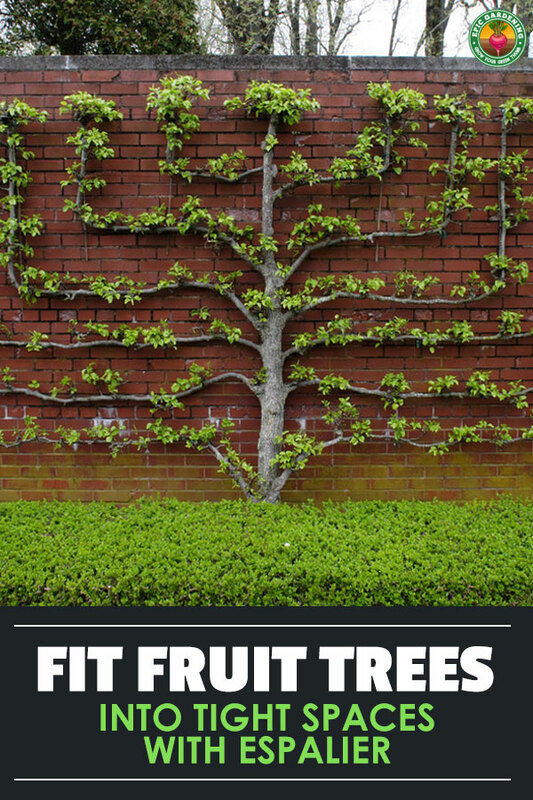 However, this doesn’t mean that you can’t do an informal espalier fruit tree at home! I’m going to provide a rudimentary guide to the basics. First, you’ll begin by deciding what kind of tree you want to grow. This may be complicated as some trees aren’t self-fruitful and require more than one tree for pollination. There are multi-budded fruit trees which are available, and these multi grafted dwarf fruit trees can be used for informal fan espalier. However, some limbs will grow more readily than others, and you will need to stay on top of pruning to ensure one variety doesn’t overtake the rest. Consider also the environment where the tree will be placed. Are the conditions right for the type of tree you want to plant? Warmer climates may not have a cool enough winter for apples, as an example, where cooler climates may find it difficult to grow some forms of citrus. Remember that many types of stone fruit are tip-fruiting, meaning that only the tips of branches produce the fruit. With these, you will need to have more offshoot branches to provide fruit than you would other varieties. A one-year old “maiden” tree is usually best to begin with, as younger trees are easiest to train. Once you’ve decided on the type of tree you want to grow, it’s time to consider the next step. Depending on where you live, different locations will have different impacts on tree growth. Trees are full-sun dwellers, and most are going to want sun year-round even if they go dormant in the winter months. For the majority of people in the United States, that means a south-facing orientation is best. South-facing trees have the benefit of more sunlight during the winter months, enabling them to stay warmer even if it’s cold out. Putting your tree against a wall will also help protect it from chillier conditions. I recommend planning well in advance and watching how much light your intended location gets at different times of day. Choose a location where your tree won’t be shaded too heavily and where it can develop in a healthy manner. Depending on the shape you want your tree to develop, you will need more space. A horizontal cordon-type can take up to seven feet of wall space to develop, where a Y-shape may take as little as five feet. 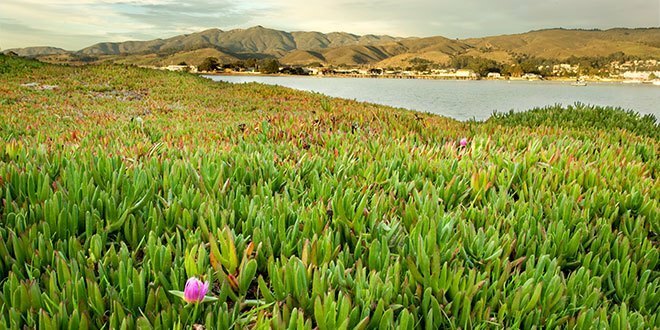 If you plan on growing a particularly large species, it can take even more wall space. Plan accordingly! Depending on the type of espalier that you’re doing, you need to create a support mechanism. For a dwarf tree that you plan on keeping small, this can be as basic as a wooden trellis. However, larger espalier styles need more support. These supports won’t actually bear the tree’s weight as much as they will encourage the tree to grow along the set path you’ve decided on. But they still have to be sturdy enough to handle possible tension, especially if a branch tries to grow in an unexpected direction. 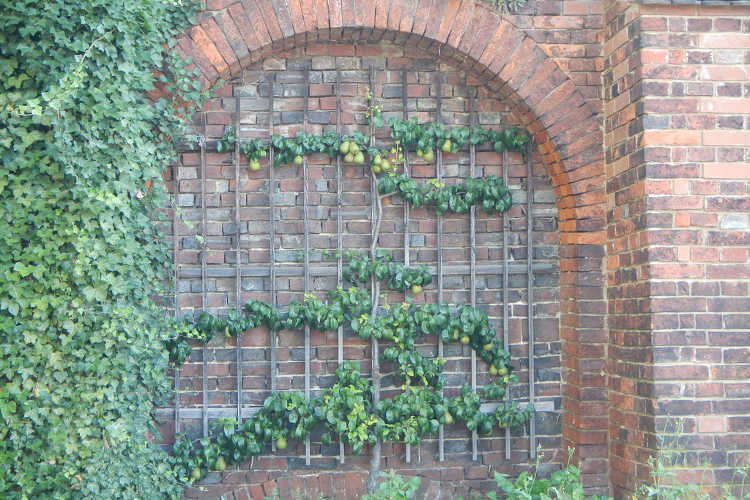 One of the most common espalier trellis designs is meant to be used with a brick or concrete block wall. 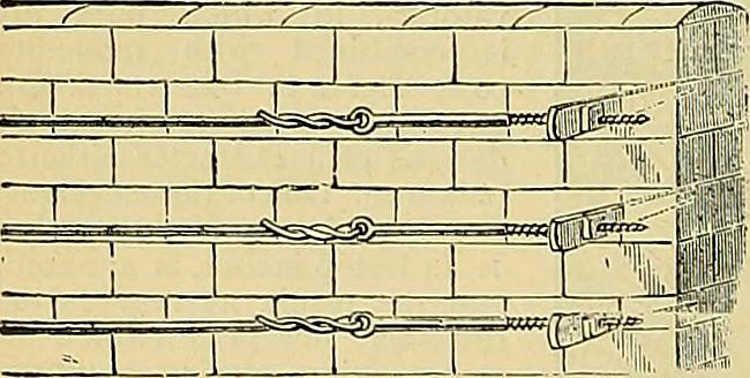 Securing brackets are mounted in the wall, and heavy-duty wires strung with tension between them. Tying off branches to these tensioned wires will help direct their pattern. 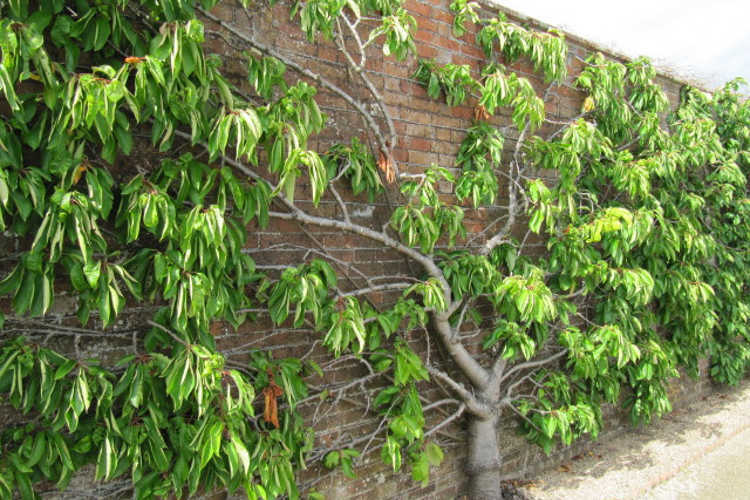 One of the simplest espalier patterns for the beginner is a Y fan. 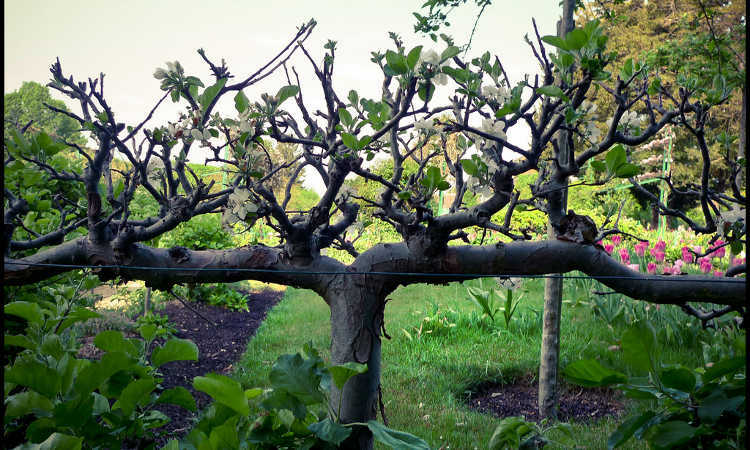 In essence, you’re shaping espalier fruit trees in a Y shape, and then allowing short fruiting spurs to develop along the two upper arms of the Y. This will need to be started in late winter or early spring, before your tree comes out of winter dormancy. That way it can devote its attention to developing the branches you want it to develop! Begin by preparing your soil, and then plant your tree 8-12″ away from the wall where your support will be. If you’re concerned about foundation damage, you can plant as far as 24″ from the wall and then train your tree to bend back towards the supports. When planting, be sure to spread the roots outward and away from the wall to encourage outward growth. Also, do not plant the tree deeper than it was initially planted, especially with a grafted tree. Once your 1-year-old tree is planted, examine the trunk. You are going to need to select a point above two buds on either side of the trunk. This needs to be done relatively low to form the bottom stem of the Y-shape, but ensure there’s still plenty of extra buds beneath the pair you choose to cut at. Trim off the trunk above those buds. You will want to make an angled cut that goes downward and away from the uppermost bud, but do not cut into either of the pair of buds you select. Those buds will produce your Y-arms once the tree becomes active again. Water and fertilize your tree and allow it to come naturally out of dormancy. As it grows, all of the existing buds on the trunk will produce new growth. As the branches grow, keep an eye on their progress. You will be selecting a healthy, matched pair of branches to create your Y arms, and those may not always be the top two. Make sure that the pair of branches you select grow at the same rate and are at about the same height. Once a few months’ time has passed and you’re well into summer, you should be able to remove any branches that grow too quickly or slowly, or that won’t grow in the configuration that you want. Use horticultural ties to secure your chosen pair to the supports to angle their growth. By late summer, you should have a tree which looks like a Y. You can encourage additional growth in subsequent years to create more of a fan shape, or encourage two pairs of branches to grow during that first year instead of just a single pair and train them accordingly. 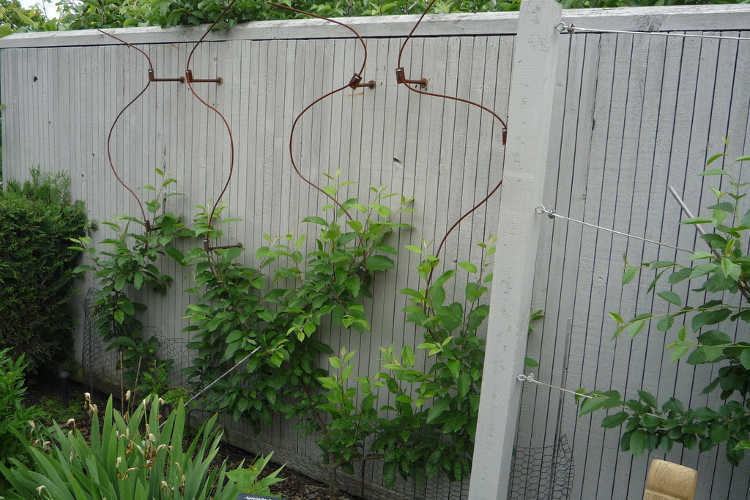 When training horizontally-oriented espalier fruit trees, you’ll need more wall width, and will need to set up your supports in advance to accomodate that. These supports need to be exceptionally sturdy, as you’ll be teaching your tree to grow directly along the support structure. Measure 48″ above the soil surface and mark the wall. This will be your uppermost tier. 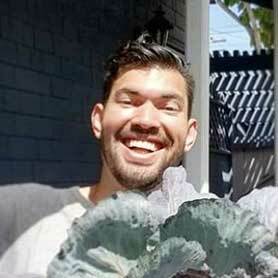 Mark at 36″ above soil surface and 16″ above soil surface as well, and those will be the level of your two lower tiers. Place your wires level to those marks. Examine the trunk of your tree before purchasing to be sure that there are healthy buds along its entire length. Picking the right tree for this purpose is essential, as you’re going to want ample buds along its length. Once you’ve prepared your support structure and selected your tree, plant it in the late winter or early spring before it comes out of dormancy. Examine your tree at the level of the lowest wire, and select a pair of buds which is on either side of the tree at or close to the level of your lowest wire. Trim off the trunk of the tree 1-2″ above this point, being sure to cut it at an angle away from the uppermost buds. As the tree comes out of dormancy, allow it to develop many healthy shoots before you select the pair of branches which will form your lowest tier. 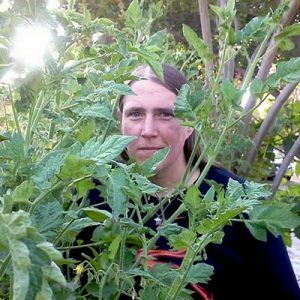 There will be slow vertical growth coming out of the top of the tree, but keep that trimmed to about 6″ above the lowest wire for now. Once you’ve selected the pair of branches, begin training it along the lowest wire by using agricultural ties to secure the branches in place. As they grow along the support, keep trimming down the vertical growth until the lowest tier has reached 3/4ths of the length of your training wire. After you’ve established that bottom tier, allow upper trunk growth to continue up to the second wire and then repeat the process to start that tier. Repeat again for the third tier once your second tier has become established. Continue this process until you’ve reached the desired width and height, and then simply maintenance prune your newly-espaliered tree. You can remove excess tip growth beyond your supports and keep pruning down offshoots to 4-5″ length. In time, every flower on your tree will become a fruiting spur, and your tree will begin to develop fruit. This process can take 4 to 5 years to create a mature tree, but as long as you maintain it, it will produce fruit for many years to come. Often, fruit produced on an espaliered tree is larger and sweeter than fruit on a standard tree, because it’s exposed to more sunlight and there’s less of it, meaning the tree can focus on making a few delicious fruits instead of many regular fruits. Don’t expect fruit in your first couple years of training your espalier fruit tree. Initially, it’s all about gaining the right shape. Later, you can try to encourage fruiting through fertilizer choices or selective pruning techniques. If you’re in an area where fruit tree pests are common, be sure to use horticultural oils or other products to keep your tree pest-free. 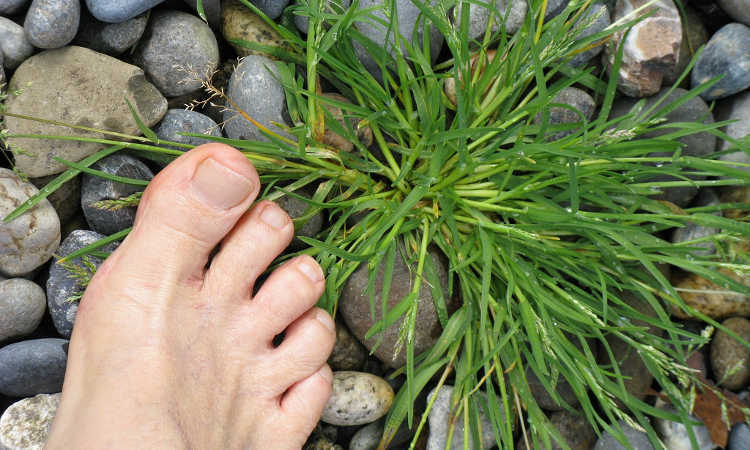 This will help to prevent many fungal or bacterial infections as well. Leafhoppers, mites, and some forms of scale insects are partial to apple and pear trees. 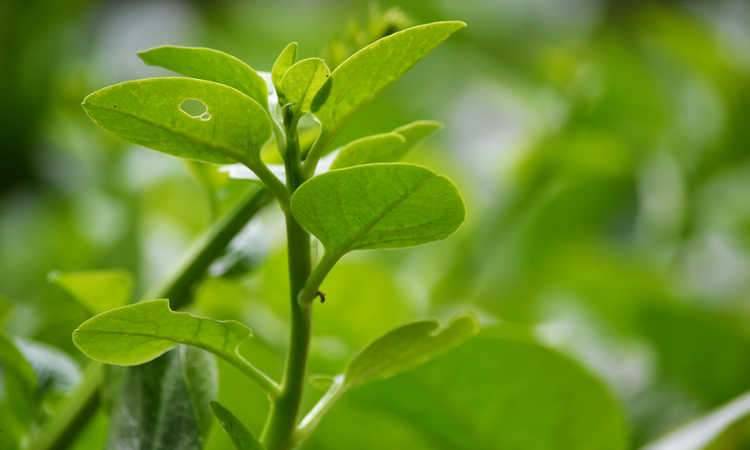 Aphids and spider mites or other mites can affect nearly all types of fruit. Keep a watchful eye out for these and other problem pests! When pruning, always take time to consider your cut and how it might change the future look of your tree. Don’t trim until you’re sure it’s where you want the cut to be. More advanced espalier patterns require what appears to be much more dramatic bends or shaping of the branches. Don’t try to force your branches in shape quickly, as it can cause cracking or breaking of the wood! Instead, provide tension by means of ties and the support structure, and gradually increase the tension over weeks or months to encourage the tree’s branches to bend on their own. This is especially important when encouraging 90-degree angles like formal candelabra patterns. There are many books which can give you more insight on the best ways to encourage dramatic tree shapes, but initially it’s good to start with something simple like a Y or a horizontal cordon and develop from there. It will take time, but you’ll be pleased with your results. Finally, if you live in an area where deer come to visit, be watchful over your young trees. Deer love that they can reach the new growth and may nibble on your neatly-pruned espalier fruit trees! Ready to try creating your own espalier fruit trees? I’m thinking of growing an espalier citrus tree and possibly a self-fruiting peach or apple! What espalier fruit trees or patterns have you seen? Share your stories in the comments below! Espaliering your trees is such a good idea! Saw some like this in the gardens of Phoenix Park in Dublin. AMAZING! Espalier is a beautiful technique, especially if you’re low on space and want fruit trees. And one of the best perks of it, at least from a fruit-fan’s perspective, is that you get fantastic fruit that way. By limiting the number of fruit on the tree, all of the tree’s fruiting energy goes to the few that remain. Some of the best plums I’ve ever eaten in my life came off an espaliered tree!